The news has been dominated this week by stories pertaining to Thaksin and Cambodia but there have been a few gems to be found otherwise. This week saw Cambodia appoint Thaksin Shinawatra, Thailand’s former Prime Minister, as personal advisor to Cambodia’s Prime Minister and economic advisor to the government. This is comes on the heels of Cambodia offering Thaksin refuge and then offering him the job of economic advisor a few weeks ago. This move prompted Thailand to recall it’s Ambassador to Cambodia and Thailand’s Prime Minister, Abhisit Vejjajiva, to call for diplomatic retaliation against Cambodia for interfering in Thailand’s affairs. I really didn’t think Thaksin would stoop so low as to take this job offer. Obviously he wants to be as close to Thailand as he can as he plans ways to get back into his native country but by doing so through Cambodia he weakens his already tenuous position. His own backers and political allies see Cambodia as a threat and becoming a friend of your enemy is never a good way to endear your people. It’s hard to imagine what Thaksin might be thinking but thinking clearly he is not. What seems more plausible is that Cambodia is using Thaksin to antagonize Thailand further, seemingly instigating Thailand towards a conflict. With tensions already high in regards to the land dispute surrounding the historic Preah Vear world heritage site this new jab in Thailand’s side will only serve to anger the Thai people more. One can only hope that Thaksin will come to his senses and bow out gracefully but it seems he is bent on regaining his former glory and will stop at nothing to get back into or at Thailand. Either way this appointment is hardly an innocent gesture to a friend in need. There are many invisible strings attached to this appointment and if Thaksin doesn’t understand the implications of these strings then he might very well become the most hated man in Thailand, especially if armed conflict breaks out. With the arrest of a third person this week for allegedly spreading internet rumors about the Kings health in order to take advantage of the Thai stock market, Thailand has moved yet another step backward. The concerns over the Kings health have been prevalent since he was hospitalized a month ago and it’s unlikely anything said by the three people accused had much impact on the market considering the major news sources were reporting that the Kings health might not be as good as the palace reports. While the palace only has good things to say most people of average intelligence understand that lung inflammation is actually a nice way of saying pneumonia, and everyone knows that pneumonia and the elderly is not a good combination. The Thai government went even further this week to protect the King when Thai a Thai information and communications minister threatened internet service providers and websites with legal action for discussing the Kings health online. Thai Information and Communication Technology Minister Ranongrak Suwanchawee even went as far this week to brand the websites Prachatai.com and “Fa Diew Kan” (Under the Same Sky), as “subversive.” You can see Prachatai’s feed here in the far right sidebar. Thailand officials just don’t seem to understand that by limiting free expression of speech they are not protecting the King but telling the world that they have yet to make it into the 21st century. Closing down web sites and prosecuting those they think are subversive is a massive step back into the dark ages and the world community is watching and won’t be forgiving in this matter. At 85 years of age former President Jimmy Carter shows no sign of letting up when it comes to Habitat for Humanity. He and a large group of volunteers will soon be heading to South East Asia to build new housing in poorer communities of Thailand, Laos, Cambodia and Vietnam. Normally I would have something to say about American charities not doing enough at home before conquering the world but Habitat for Humanity is one of those rare entities that actually does what it says it will and does it extremely well. Mr. Carter may not be recognized by future generations as a great president but he will undoubtedly go down in the annals of history as a great humanitarian. And at 85 and going strong he is a much better man than I. And now for the feel good story of the week. Monks at the Tung Luang Buddhist temple in Thailand’s Chiang Mai province recently began caring for a 3-month-old macaque monkey whose mother was killed by a hunter. Helping them with the task of raising the young monkey is Tan, a resident “temple dog” who not only shares his food but has become fast friends with the monkey. 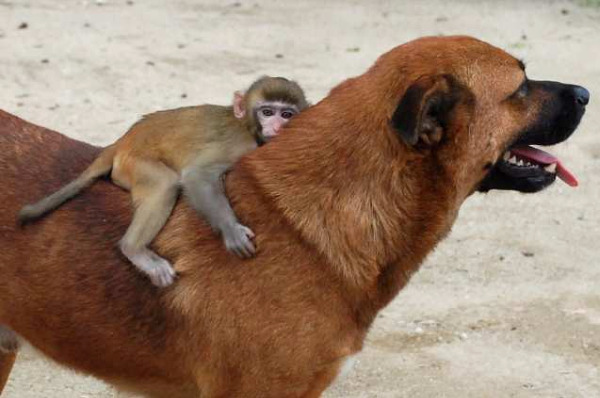 This begs the question…If a dog and a monkey can become friends and help one another out why is it that human beings who are of the same species often find it difficult to do the same? We are supposed to be smarter, aren’t we? While I do think Carter is very intelligent his presidency was a mess and he was a very ineffectual leader. Even today his political motivations draw bad press. His humanitarian efforts are what he will be best remembered for. Agreed Cat…I much prefer the company of monkeys over politicians anyway. 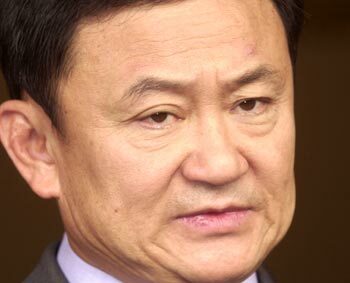 Martyn, I fear that dour look on Thaksin’s face may be the new look of Thailand soon if he continues on this path. Already the PAD are asking the government to take back the land around Preah Vear from Cambodia by force if necessary. I have to agree that Chiang Mai might not have been the best choice to help out but it is a start I guess. That’s not a post, Cat, that is every Americans reality!